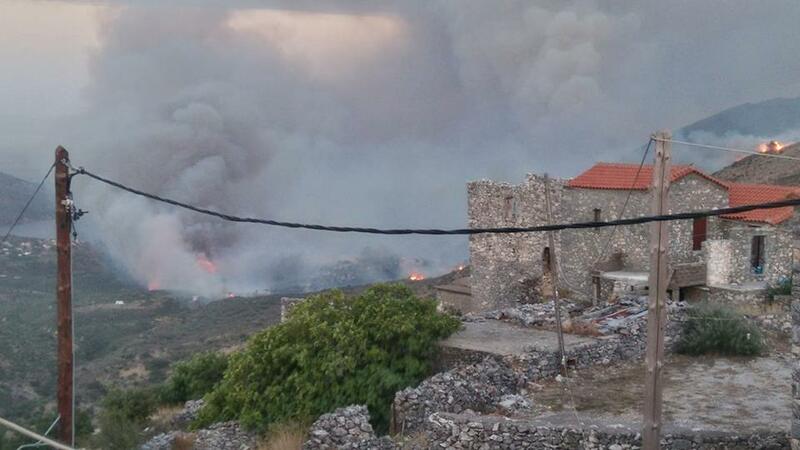 The area of ​​eastern Mani, Peloponnese is still suffering from the fires that started on Saturday destroying houses and forest lands. Even though firefighters and local volunteers had managed to contain the blazes on Sunday afternoon, the fires rekindled on Sunday night reaching residential areas. The most serious blazing fronts are located in the areas of Kotrona, Chrysopigi, Parasiros and Skoutari, where 150 firefighters are operating with the use of 40 vehicles on the ground. According to testimonies that are not confirmed, the fire was caused by a Public Power Corporation transformer. Four houses were burned in the Kotrona village and five more are damaged. The Prophet Elias church was also burned down with the village cemetery suffering damages as well. Luckily, most houses in the village are stone-built and were saved from the flames. The strong winds in the area, combined with the high temperatures of the previous days make it hard for firefighters who are continuing their battle.